"Company" "The Little Things You Do Together" "Sorry-Grateful" "You Could Drive a Person Crazy" "Another Hundred People" "Getting Married Today" "Barcelona" "The Ladies Who Lunch" "Being Alive"
“Company” ushered in the 1970s and a revolutionary series of collaborations between Stephen Sondheim and director/producer Harold Prince. The show centered on a 30-something bachelor named Robert, the hub of activity for the five married couples who spiral around him. Unlike previous musical comedy heroes, Robert was utterly ambivalent about love and completely averse to commitment. The score would be written almost perpendicularly to the collection of George Furth plays on which it was based, with characters reflecting on scenes they weren’t in, or stepping outside of the situation to comment on themselves, on love, on marriage, on commitment. The context of the show was mod Manhattan in the 1970s, utterly unromantic, a city of strangers. 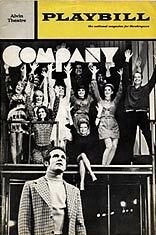 The upper-middle class problems that the audience “came to a musical to avoid are suddenly facing them on the stage,” said Sondheim. For some, this crisp critical contemporaneity was a tonic, while others found this world too misanthropic, but Prince and Sondheim would thrive on controversy; indeed, they would embrace it, and the show and its creators were all rewarded with Tonys.